A hordeolum, sty or stye is a small, red, generally painful lump on the upper or lower eyelid, similar in appearance to a pimple. Styes can be external or internal and affect one of two sets of glands situated on the lining of our eyelids. The main cause for styes is a bacterial infection most often caused by the Staphylococcus aureus bacterium, but blocked sweat glands are a common cause as well and may generate infection in return. Styes are contagious. Though they may appear worrisome, styes are most likely to resolve themselves in as little as 4-5 days or as long as 2 weeks. There is also the rare possibility that a stye may become a chalazion, which is a small cyst inside the eyelid caused by the inflammation of a gland situated along the margin of the eyelid. While chalazia takes longer to heal and may require medical intervention, styes are less problematic because they will heal naturally with only good hygiene. What is a stye? As mentioned above, a stye is a small, red, painful bump that can appear on either the upper or the lower eyelid. It is common in children and adults of all ages and is generally caused by an infection with the Staphylococcus aureus (gram-positive) bacterium that also causes skin and respiratory infections or food poisoning, among others. Styes may be internal or external. While both are contagious, internal styes may prove more problematic than external ones. What does a stye look like? Well, styes are swollen little red bumps or lumps on the line of our eyelids. They look a lot like red, tender pimples and may appear anywhere on the lashline, either on the upper or lower eyelid. In addition to discomfort, styes may cause a droopy eyelid or a mucous discharge. Where do styes appear? Although it is commonly referred to as a ‘stye in the eye’, a stye actually appears on the margin of the eyelids, at the base of the eyelashes. But where does a stye come from? Styes are little, red bumps caused by an infection of either the sebaceous glands or sweats glands situated along the eyelids, called glands of Zeis and glands of Moll. The infection is often cause by the Staphylococcus aureus bacterium which can live on our skin, in our ears or nose. So picking our nose and then rubbing our eyes or scratching our eyelids can be a potential cause of infection and styes. 1) Visible bump or lump on the margin of either the top or the bottom eyelid. 2) Swelling of the bump and eyelid. 5) Burning and itching sensation. 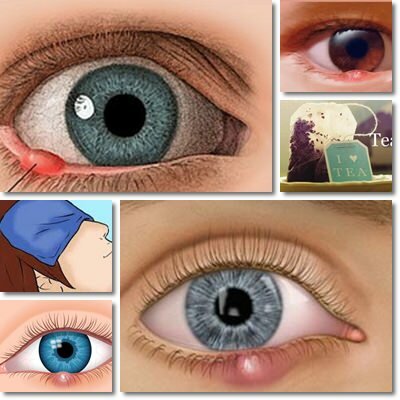 7) Light discharge, usually when the stye breaks and the infection leaks. 8) Crusts and mild blurred vision. 9) The feeling you have something in the eye. 1) How long do styes last? Depending on its severity, a stye generally takes 7 to 10 days to heal. Some people report them healing in as little as 4 days, while for others it might take up to two weeks. If healing takes longer than 14 days to heal, it might be best to see your doctor for adequate diagnosis and treatment as the infection might have progressed. 2) Are styes contagious? Yes, styes are contagious. If you stop to think about it, a stye is actually an infected eyelid gland and contains bacteria and puss. Good hygiene is imperative not only to help it heal faster, but also to prevent infecting others. Rubbing your eyes or even touching the affected area and then touching the eye of a friend can result in spreading the infection. It is recommended to avoid touching your eyes as much as possible, wash your hands often and avoid sharing pillows, bed sheets, towels, cutlery, face care prodcuts or any other item that may come into contact with your eyes. 3) How to get rid of styes. Styes should resolve themselves. Nonetheless, there are some things you can do to prevent infecting others or worsening your own infection. You can encourage the healing process by applying warm chamomile or calendula compresses (or tea bags) to the eyes for 10-15 minutes, 3 or 4 times a day to reduce swelling. Any medicinal herb with anti-inflammatory properties that you are not allergic to can help. Also remember not to burst or squeeze the stye. Because it is contagious, breaking it can worsen your infection, reduce healing time and increase the risk for others to get infected. You can also supplement with several nutrients to help build immunity and promote a faster healing. Vitamin C and zinc are two powerful immune-boosting nutrients to help you with any kind of infection. 4) Do styes require antibiotics? Styes should heal themselves in about 10-14 days maximum. Antibiotics are not usually prescribed. Only if the infection does not heal or worsens, spreading to other parts of the eye, your doctor might prescribe you an antibiotic ointment. 5) Do styes recur and if so, why? Styes are known to recur. If this is the case, your doctor might prescribe you an antibiotic ointment to keep the infection under control, promote healing or prevent the infection from spreading. Also, it might be best to replace all of your cosmetic products and sanitize your makeup brushes to prevent reinfection. 6) What is the difference between a stye and a chalazion? A stye will appear on the margin of the eyelid, while a chalazion occurs on the eyelid. Chalazia are cysts caused by inflammed glands and usually do not hurt, unlike styes which are painful. Unlike styes which do not generally require treatment, doctors might prescribe antibiotics and even minor surgery for chalazia. Moreover, chalazia may take up to 4 months to heal and it may take our body up to 2 years to absorb the cyst, while styes heal themselves in about 7-10 days.